On Sunday, November 18th there will be a public demonstration to kick off the The People's Assembly referendum. The public are encouraged meet at Harbourside Park in downtown St. John's at 12:00 noon and join the march to the Colonial Building for a rally. The People's Assembly is a grassroots forum for direct democracy. It is an alternative to an unresponsive system of top-down party politics. The People of Newfoundland and Labrador have the right to actively participate in the political process and the civic responsibility to ensure this happens. 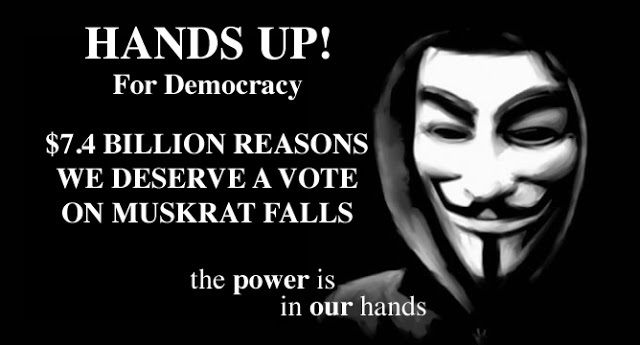 To this end, the People's Assembly is holding a week long Referendum on Muskrat Falls, running November 18th through 25th. Throughout the week there will also be daily marches and other actions in order to bring the political process back to the People. Regardless of differences on the merits of the Muskrat Falls project, few can be satisfied with the process as it has unfolded. Participating in the referendum is a way to take part in this political decision, but also to show your dissatisfaction with a broken political system. This is your opportunity to show the government that they can not take your vote for granted.